Let's Do It for ME! : 15% off ends 13th January! 15% off ends 13th January! 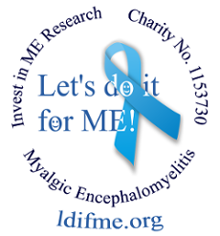 All seller proceeds from our online shops go straight to Invest in ME charity for biomedical research into myalgic encephalomyelitis (ME). This Spreadshirt offer ends January 13th. 15% off your entire Spreadshirt order (no minimum). LET'S BE SEEN IN 2015! your awareness or fundraising events. You can email them at: info@investinme.org or contact them via their website).